You mean I'm supposed to eat that? …Life as an ESL teacher in Korea. Fish are Eating My Feet! Nom Nom! 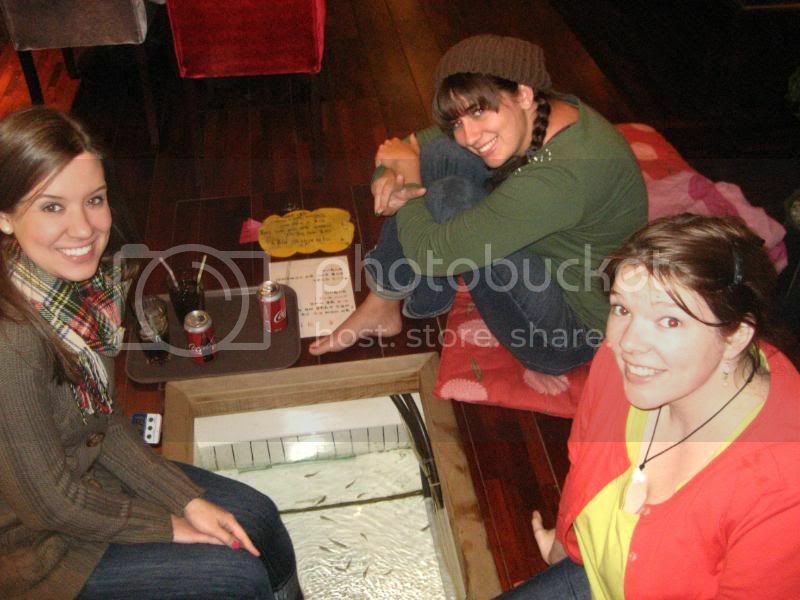 I have always wanted to visit one of those strange cafes that have tanks of fish you put your feet into. Before coming to Korea, I saw them online and thought it would be fun. After 11 months, I finally made the trip. Tiny fish nibble dead skin off your feet. Sounds weird, but feels even weirder. These cafe/spas are found throughout Southeast Asia. Special kinds of fish eat only the dead skin, leaving healthy skin to grow. Sometimes these fish are called Nibble Fish but commonly are called Doctor Fish. A franchise here in Korea even calls itself the Dr. Fish cafe. 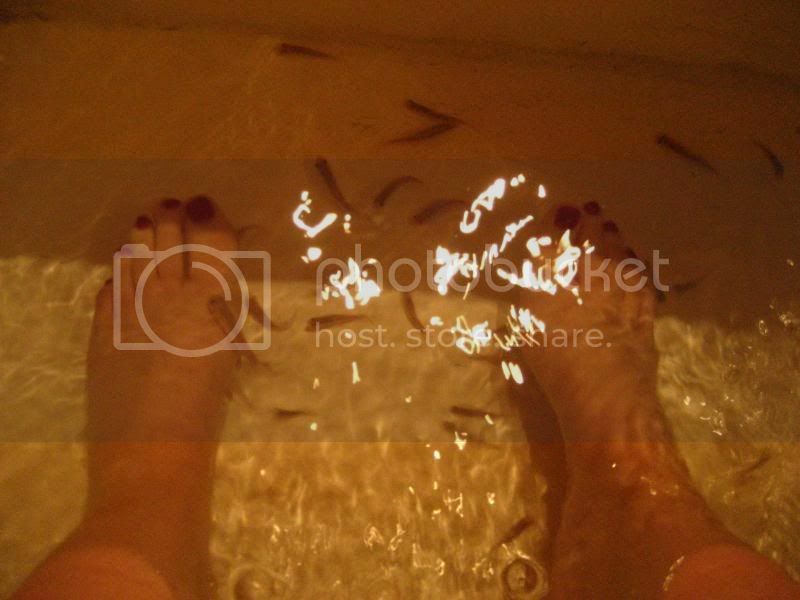 Put feet into the tub of fish. Wait…as fish eat your feet. Nom nom nom. Okay, not actually your feet, just the dead skin on your feet. The fish tickle your feet as they nibble, but not to the point of actual laughter. More like a bit of the ‘pins and needles’ sensation. Sometimes my foot was completely covered in tiny fish; but most time, was more like 6 or 7 fish. Overall, the experience was pleasant if weird. This cafe in Beomgye was super cheap. For 20 minutes of fish-time we paid a little less than $2. Plus, they brought us free cokes. How awesome! I have heard that Dr. Fish cafes are all over Korea, but I haven’t seen very many. Sanbon has one of these cafes, but all the fish died (must be dirty foreigner feet). They never replenished their fish supply. Don’t really understand that one… considering the cafe is called the Dr. Fish Cafe. Other than nibbling fish, the cafe offered a great selection of coffee and baked goods. I have never put videos on my blog before… so I hope this works. The bright red toenails are mine! This entry was posted on January 15, 2010, 12:08 pm and is filed under Korean culture. You can follow any responses to this entry through RSS 2.0. You can leave a response, or trackback from your own site. The sale is going well… the main stuff we needed to get rid of is sold. Still have a week for the rest of it. This used to happen to us when we would go swimming in the Guyandotte River as kids. We’d get really still and the fish would pick on your flesh anywhere it was exposed. Such a strange feeling. I am just glad they were not big fish! I enjoyed the videos both the fish and the envoy in the snow. Who was in the envoy and is this the only “roads” there are? I think this looks like some great experiences! keep up the fun, gross and exciting times I say! Great site!Thanks for sharing!Good luck everyone! From January 2009 to January 2010... Seth and I will be teaching English in a hagwon. We are located in a satellite city of Seoul called Sanbon. It's a "smaller" town, laid back, and we are enjoying life. Jayden667 on Fish are Eating My Feet! Nom Nom! Laura@ esl classes los angeles on Fish are Eating My Feet! Nom Nom!